William de Percy is a luxury boutique coaching inn located in the heart of Northumberland on the Scottish borders. This luxury bed and breakfast is situated in Otterburn, a small village on the banks of the River Rede – which is just 31 miles of Newcastle Upon Tyne. William de Percy is renowned for being a lovely dog-friendly bed and breakfast in Northumberland. Your four-legged friends are allowed to stay in the rooms with you and sit in our pub while you enjoy our delicious food and drinks – what more could you ask for?! As there are many dog walking routes across Northumberland, it makes sense to offer pet-friendly accommodation. Once you have finished your walk and took in all the sights of the beautiful scenery. What better way to finish off than relaxing in the pub? Therefore, dog-friendly pubs in Northumberland are the perfect option for you to relax with your dog. The rooms at William de Percy are all uniquely different, with elaborate decor and contrasting atmosphere – you won’t be visually bored during your stay at our bed and breakfast. If you’ve come for a cosy getaway from the hustle and bustle of work life, then William de Percy is the perfect place for you! Don’t worry though, we have super-fast WIFI in every room, so you won’t be totally cut off from the outside world. Each room also has complimentary Netflix.  The William de Percy Coaching Inn and Crêperie menus are packed with all the usual, and a lot of the unusual, pub paraphernalia but with an added sprinkle of edible oomph. Our menus are packed with good hearty food, added with some quirky flavours that you won’t be able to resist. Whether you re looking for a lovely Sunday lunch or just your typical pub dinner then you won’t be disappointed! If you are planning a trip to Northumberland, then stay with us at William de Percy. Take your dog with you and experience Northumberland and the lovely heritage we have to offer with your four-legged friends. So get in touch with us, we would love you to visit us. You are here: Home > About William de Percy!